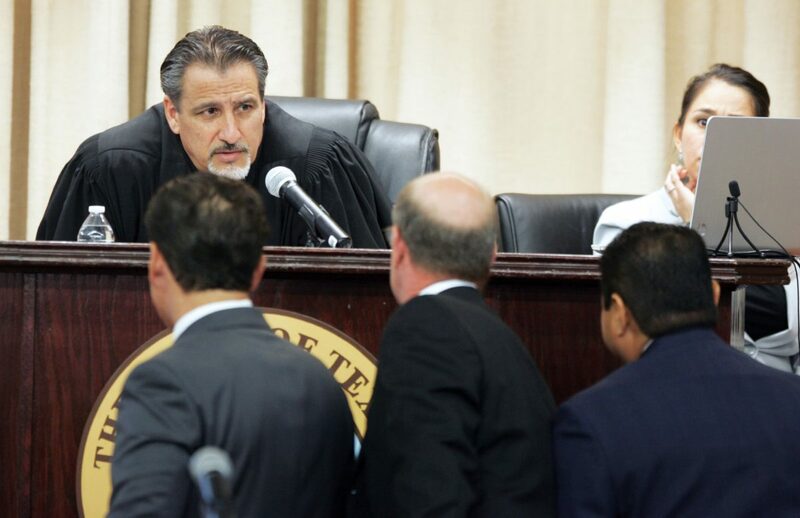 District Judge Noe Gonzalez talks with lawyers for the defense and prosecution during jury selection in the capital murder trial of Monica Melissa Patterson at the Hidalgo Courthouse on Wednesday, Sept. 20, 2017, in Edinburg. 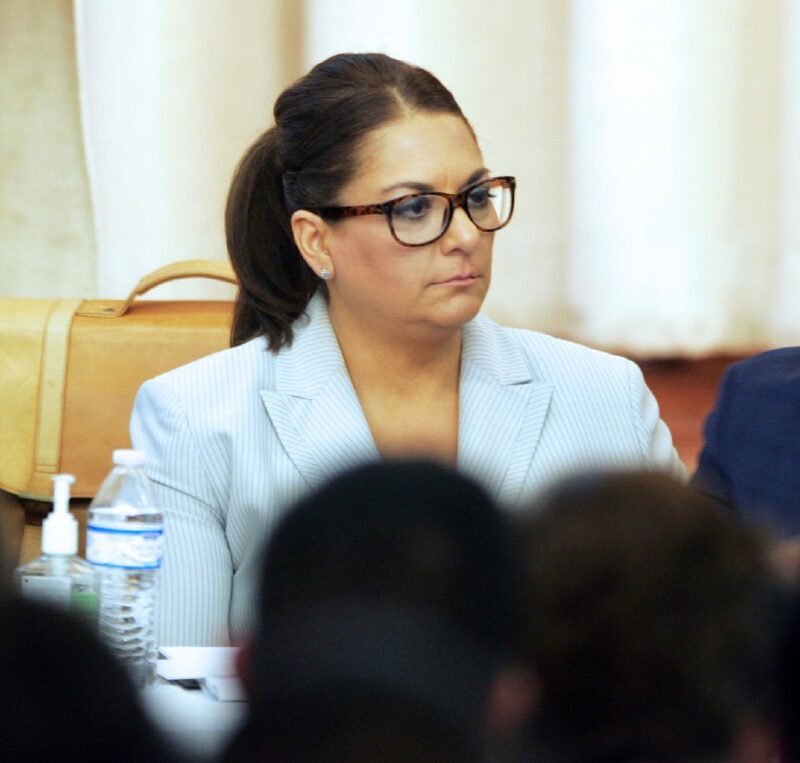 EDINBURG — Ninety-seven people entered the Hidalgo County Courthouse auditorium Wednesday morning to learn whether they would be selected to serve as jurors for the upcoming Monica Melissa Patterson trial. Nearly 10 hours later, lawyers for both Patterson and the District Attorney’s Office selected 12 jurors and four alternates — four men and eight women to make up the jury with the alternates split evenly between men and women. When the trial begins on Monday morning, jurors will be tasked with deciding whether Patterson, 50, is guilty of any, some or none of the four charges she faces. The charge that has garnered the most attention, and is arguably the most serious is for capital murder — a first-degree felony carrying a sentence of life in prison without parole. The state decided not to seek the death penalty early on in the case. The state, which is represented by Assistant Criminal District Attorneys Joseph Orendain and Cregg C. Thompson, will argue that Patterson allegedly killed Martin Knell by asphyxiation on Jan. 28, 2015. Specifically, Patterson is accused of “intentionally and knowingly” causing Knell’s death with a plastic bag or an item unknown to the grand jurors for remuneration — meaning for financial benefit. Patterson is also charged with theft of property related to her connection with Knell’s estate, which is punishable by two to 20 years in prison. The state alleges that Patterson deceived Knell’s son, Martin Knell Jr., on Dec. 22, 2014, to execute a will naming Patterson as the beneficiary of his father’s estate upon his death. Then, on Jan. 5, 2015, Patterson was named a payee of Knell’s bank account upon his death. On Feb. 16, 2015, the state alleges Patterson filed a will after his death for financial gain. Additional charges Patterson faces include theft of more than $100,000, but less than $200,000, and misapplication of a fiduciary from Jan. 1, 2014 through Aug. 26, 2015 — this during her tenure with Comfort House Services Inc. These carry potential prison sentences of five to 99 years and two to 20 years, respectively. Comfort House is a McAllen nonprofit that provides hospice care for terminally ill patients. 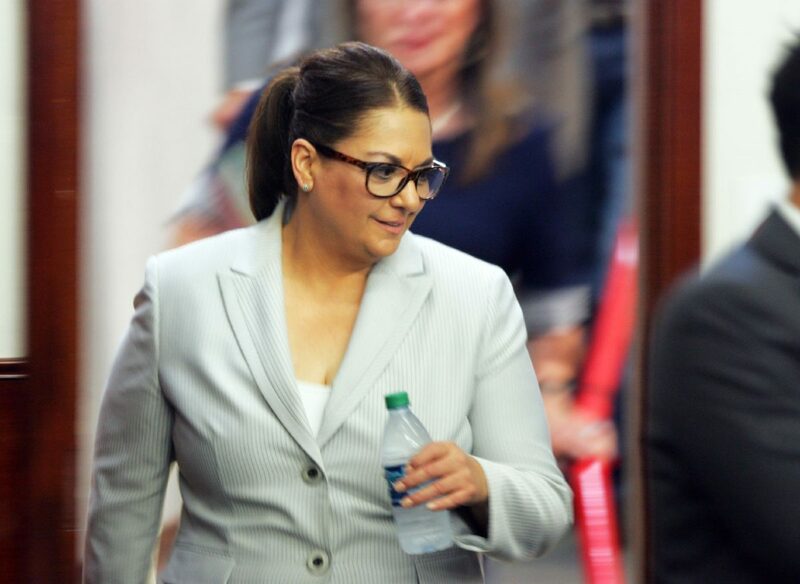 Patterson was present in the auditorium Wednesday as lawyers from both sides questioned potential jurors in what Calixtro Villarreal — one of her four lawyers — called a process of elimination. 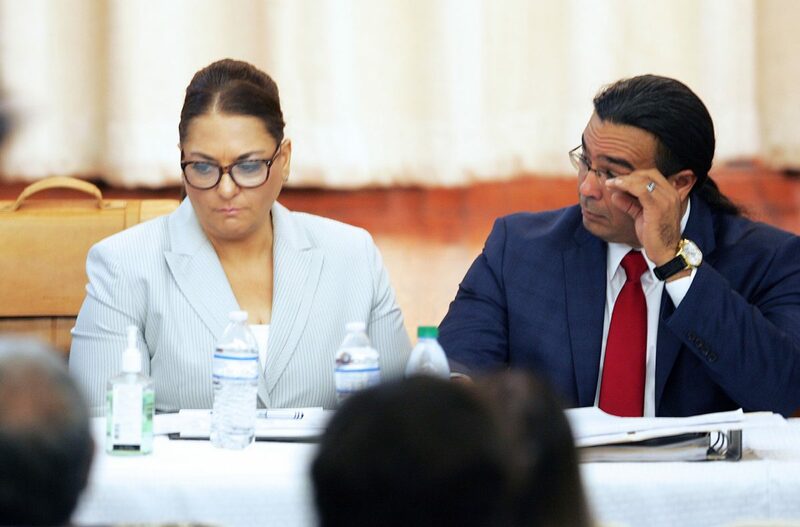 Dressed in a suit and wearing thick-rimmed glasses, Patterson blended into the team of lawyers surrounding her, which also include Ricardo Salinas, O. Rene Flores and Fernando Mancias. Throughout voir dire , the prosecution and defense, in addition to state District Judge Noe Gonzalez, underscored that Patterson is presumed innocent until proven guilty. In order to be a good juror, one must be fair and impartial and follow the law, Orendain said. “The purpose of a jury trial is to search for the truth,” Villarreal told those assembled in the auditorium. During the prosecution’s questioning of potential jurors, Orendain repeatedly asked jurors’ about their connections and knowledge of Patterson’s family. The Palacios family wields various levels of political influence in South Texas. 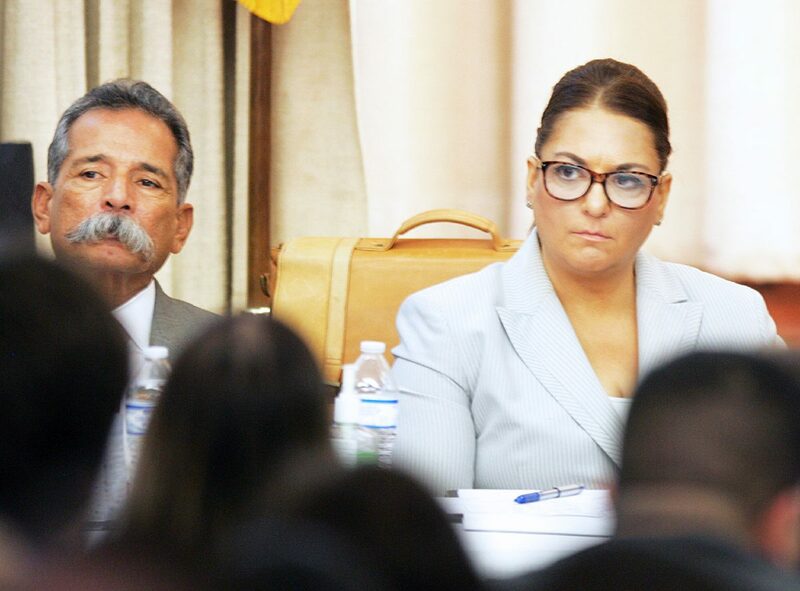 Family members include her father Hector “Tito” Palacios, a former Hidalgo County Precinct 2 commissioner and former San Juan mayor; Berta Palacios, a PSJA school district administrator; and her brother, County Court-at-Law Judge Jaime “Jay” Palacios, who continues to work in the same courthouse where she is being tried. Many potential jurors said they knew members of the Palacios family, either from school, work or their neighborhood. Orendain also asked jurors about their relationship to Mancias, a former state district judge. One woman said Mancias officiated her first marriage. “I think he’s a distant relative,” she added. Given the Palacios family’s influence in Hidalgo County, the case has generated significant media coverage. When Orendain asked how many people had heard or read about the case in the news, nearly everyone in the auditorium raised their hand. “Everybody knows something about this case,” Salinas said. The co-defendant in the case, Angel Mario Garza, 39 — who the state alleges assisted Patterson in Knell’s death — will be tried at a later date.